◊ Check out the facility! ◊ Sign up for lessons and classes! Pre-Register by clicking on the button below. We’re SO pumped that you’re here, and we can’t WAIT to get started! We’re looking for passionate, dynamic individuals who want to set hearts on fire for music! Click below to submit a complete Application for Employment to let us know you want IN. Interested in learning a new instrument? Always wanted to sing? Love being a part of a creative community? Click below to submit your contact information, musical interests, and availability. Still unsure what to do? Click below and drop us a line! Ask us anything! Just say, “Hi!”…or “‘Sup?” works, too! We’re just happy you’re here and want to share our love of music with you! Interested in making a donation, becoming a patron, or acquiring naming rights at SSMA? Learn more about our “From the Ground Up” Fundraising Campaign today! 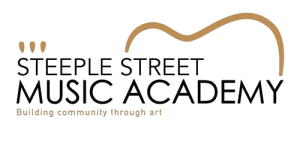 We are teaming up with the folks at Mashpee Commons to bring you Steeple Street Music Academy, located at 40 Steeple Street in Mashpee, Massachusetts! We’re the stand-alone, white building with Greek columns (appropriate!? ), across from the outdoor stage. Come check us out! Song credits: "Fields of Brooklyn," by Jeremy Kittel, performed by Kittel & Co.